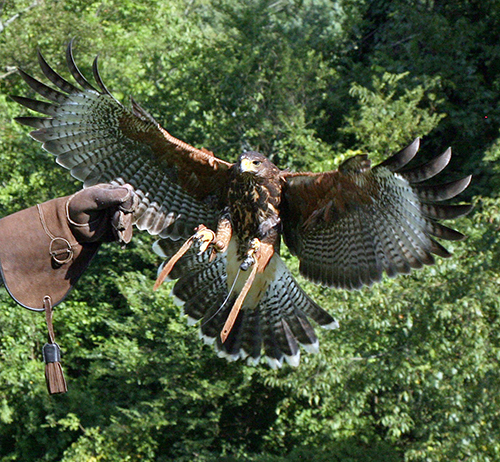 Discover the ancient art of falconry on Biltmore’s historic grounds. Your fascinating 90-minute adventure begins with an explanation of the sport and an introduction to these majestic birds of prey. Guided by a professional falconer, you will learn how to handle a trained hawk or falcon, then experience the inimitable thrill of a raptor flying to and landing upon your gloved hand: a truly one-of-a-kind opportunity to interact with one of these awe-inspiring creatures. *Price is in addition to estate admission and subject to change. Must be 8 years of age or older to participate. Guests under 17 years of age must be accompanied by a paying adult. Guests encouraged to dress for the weather and wear comfortable, closed-toe shoes. Passholders and guests of The Inn and Village Hotel receive a 10% discount. Call the Passholder Priority Line at 800-413-9787 for reservations and more details. *Discounts apply to one Passholder and one accompanying guest. Advance reservations are required for guided tours, wine experiences, and outdoor activities as space is limited. Valid Annual Pass must be presented at the time of your tour. Biltmore reserves the right to cancel any tour or activity if certain requirements are not met or due to inclement weather. Discounts are not valid on Saturdays and Christmas Day through New Year's Day. Biltmore Annual Passes are nontransferable and nonrefundable. **Audio Guide to Biltmore House not included in discount. ***Guests are required to be at least 21 years old to participate in wine experiences.